Nothing beats the satisfaction of taking an overgrown, underused area of land and turning it into a beautiful and engaging outdoor play and learning space. It’s great to see the smiles all round when the children begin exploring their new environment. Our Playground Consultant, Luke Banner, worked carefully with the Pre-School Manager at Bright Sparks, Donna Methven, to bring the 'wow factor' to their outside play space. Donna had seen some of our previous developments on our website and was looking for something similar. When Luke went to visit Donna at the site, it was overgrown with grass. They established the boundaries for a new fence line, discussed the type of surfacing that would work best, and the possible educational resources and play equipment that the pre-school would benefit from. Luke was then able to use his expertise and knowledge to turn Donna’s ideas and wishes into a playground design that would offer the children multiple play and learning facilities, that would be visually attractive, practical, and able to be enjoyed year round. After clearing out the area and preparing the groundwork to provide a level and free draining space, we installed a combination of our Playturf Artificial Grass and our colourful Wet Pour Surfacing. Pentagon’s Artificial Grass is a beautiful natural green colour and is soft to the touch - perfect for little ones - especially as they are learning to walk, run and coordinate their bodies. It’s really safe to play on and helps to avoid injuries, and because of it’s super self drainage system, the weather doesn’t have to spoil the fun. We included some colourful and engaging designs in the Wet Pour surfacing too - our numbered circles follow a winding path to help children practice numeracy and counting through movement. At first sight, it’s a really striking outdoor space. Even the fencing and storage is a feature! 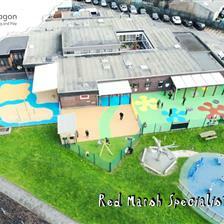 Our colourful Bow Top Fencing encloses the space and keeps the children safe. Our Walk-In Store with Chalkboard and Whiteboard (great for mark making) and our Self-Selecting Store, encourage children to make their own choices and allow them safe and easy access to their favourite toys and games. Our Free Flow Canopy provides a covered area for outdoor learning and play, so the children can now choose to play outdoors comfortably in all weather conditions, and get plenty of healthy fresh air and exercise. We designed the layout of the playground into interchangeable zones to cover all different areas of learning. View our Seating, Storage and Fencing options here. If you;d like to learn more about our Outdoor Classrooms and canopies, visit our Outdoor Classrooms Page here. This includes our fabulous Water Wall. It’s perfect for this age group, made with big wooden holes and pegs suitable for little hands to use. Children design and build their own water course, incorporating water wheels and guttering. It’s good for fine motor work and as much as being a fun, sensory experience, it’s great kinesthetic learning. There have been some interesting observations by the teachers - Donna commented that there is more critical thinking going on. They’re moving the tubes to channel the water as they want it to flow. They’re climbing up and down the steps to get the height and reach they want. Our popular Mud Kitchen encourages cooperative and investigative play, and our Covered Sand Box is a great size for a number of children to play together at the same time. 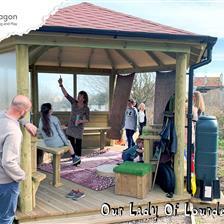 Donna wanted an outdoor learning zone with seating, as well as a calm space to be used for stories and quiet play. We installed a Giant Chalkboard and a Giant Whiteboard for mark making. A Giant Mirror allows the children to experience reflection and they love dressing up in front of this. A natural timber Weaving Panel can be used from both sides, encouraging teamwork and communication and improving fine motor skills as the children weave their chosen materials through the holes. Moveable Artificial Grass-Topped Seats ensure that there is always a comfortable space to sit, relax and listen. We have a large range of mark making boards and playground seating solutions ideal for schools, preschools and nurseries. A Giant Playhouse, Wigwam, Den Making Posts and our signature Play Ship were installed to provide endless opportunities for imaginative and collaborative play, building friendships and developing social and communication skills. The staff have dressed the den areas beautifully with blankets and camouflage nets, using it as an interchangeable space. The children are using the Wigwam as a quiet, cosy area and are choosing to take their reading books and chalkboards in there. The Play Ship feature piece in the centre, surrounded by deep blue sea surfacing, is so inviting the children can’t wait to take their turn as sailors, pirates and shipmates! It’s encouraging mark making too - they have been making their own treasure maps to follow. We have a wide-range of den-making products for early years and preschool which you can view here. The Performance Stage is ideal for encouraging creativity, communication and confidence in a social environment. This age group love performing arts activities and it’s so good for their language and movement skills, for expressing themselves and for developing confidence. They have been singing and dancing for everyone - thankfully the addition of some Moveable Artificial Grass-Topped Seats means there is always space for an audience! This zone is proving to be absolutely brilliant for helping the children to learn balance and coordination, developing their overall strength and core stability. They have been developing independence with some safe risk-taking, building confidence in their own ability. 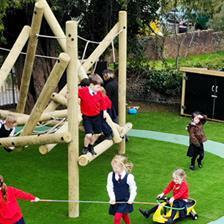 View our lovely range of Trim Trail Equipment for Schools, Preschools and Nurseries. We loved working with Bright Sparks Preschool on this incredible playground project. If you are considering improving your preschool or nursery garden, Contact Us Here to arrange a free consultation with one of our expert playground consultants. Alternatively you can call 01625 890 330 (North Office) or 0117 379 0899 (South Office).